1.e4 e6 2.d4 d5 3.¤c3 ¤f6 4.e5 ¤fd7 5.f4 c5 6.¤f3 ¤c6 7.Ґe3 a6 8.¤e2!? Јb6 9.Јc1! Topalov employs a strong idea against a popular variation with a7-a6. Black's following reaction is logical, but if we compare the ensuing position with ones arising in the variation 5.¤ce2, it becomes evident that a7-a6 is a loss of tempo. 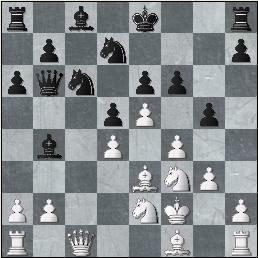 It is important for White, that the e3-bishop, cementing his structure, is defended. 9...g5 10.c3! 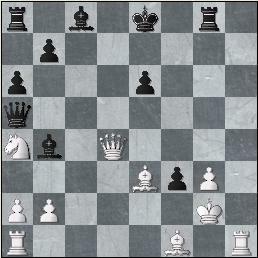 cxd4 11.cxd4 Ґb4+ 12.ўf2 f6 13.g3 To take the pawn would be at least "immoral". And even the first estimate: 13.exf6 ¤xf6 14.¤xg5 ¤g4 15.ўg1 Ґe7?, with threats of e6-e5 or taking on e3 and on b2 – gives adequate chances to Black. 13...¦f8 In such a structure standard ideas for Black are sacrifices of an exchange on f3 (to do that a rook should be moved to f8 by castling, or it will be impossible to get another rook into play) and of the extremely bad d7-knight on e5. After 13...0-0 14.ўg2 White may meditate over capture d4xe5 in reply on f6xe5, so let's try to offer everything that offers after 13...fxe5 14.fxe5 0-0. It is evident, that the only one to run risks here is Black, though. There is a couple of superficial variations: 15.ўg2 (after 15.Ґh3 sacrifice is a bit more justified: 15...¤dxe5 16.dxe5 d4 17.¤exd4 ¤xd4 18.ўg2 Ґc5 19.Ґxd4 Ґxd4 20.¦d1!? (20.¤xd4 Јxd4 21.Јxg5+ ўh8 22.Ґg4 Ґd7 23.ўh3 Ґc6<=>; 20.Јxg5+ ўh8,) and Black's position is just plain worse) 15...¦xf3 16.ўxf3 ¤dxe5+ 17.dxe5 d4 18.Ґf2 Јd8 19.ўg2 ¤xe5 20.¤xd4™ b6 21.Ґe2 Ґb7+ 22.ўg1 Ґc5 (22...Јd5? 23.Јxg5+ ўh8 24.Јf6+ ўg8 25.Јxe6+) 23.Јd2 Ґxh1 24.ўxh1 Јd5+ 25.ўg1 ¦f8 26.¦d1 ¦xf2 27.ўxf2 ¤c6 28.Ґf3+/-, Black has managed to take back most of the offered material, but, in all probability, salvation is still impossible. 14.ўg2 g4 An obvious concession. Probably, it was worth its while to try 14...gxf4 15.gxf4 fxe5 16.fxe5 ¦g8+ with an idea of 17.ўh3 ¤f6! 19...¤cxe5 After 9...¤xd4 20.¤a4 Јc6 21.Ґxd4 Јxa4 22.Ґd3 Black runs risk of lack of development, but sacrifice made during the game leads to a bad position anyway. 25.ўf2 It is possible to prepare the self-suggesting ¦h1-h8 by way of25.ўg1!? After 25...Јxa4 (25...Јc7 26.Ґf4; 25...e5 26.Јc4 ¦xg3+ 27.ўf2 ¦g4 28.¦h8+) 26.¦h8 ¦xh8 27.Јxh8+ ўf7 28.¦c1+- White wins. The move made during the game should lead to a win still faster. Now that is the serious mistake. A slow but sure way to victory is 27.¦h8 Јxd4 28.¦xg8+ ўf7 29.Ґxd4 ўxg8 30.¦h1 e5 (30...ўf8 31.Ґe5!) 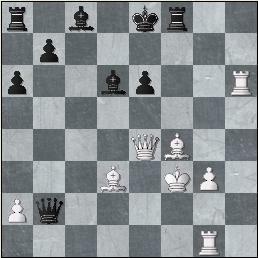 31.Ґxe5 ўf7 32.¦h8+-, and while Black is trying to unpin, the g-pawn queens. 27...Ґd6?! 27...Јg7 is evidently stronger, although after 8.¦ag1 (28.Ґf4 Јxb2+ 29.ўxf3 Ґc5 /\Ґd7-c6) 28...Јxb2+ 29.ўxf3 Ґd6 30.¦h6 White retains the initiative. 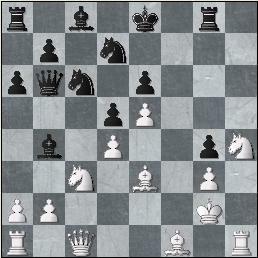 31...Јe5 A very deep analysis is likely needed to prove White's advantage after 31...Јa3!. After 32.¦d1!? (a mere human would have unpinned the king: 32.ўg2!? Јxa2+ 33.ўh1 Ґxf4 34.Јg6+ (34.gxf4 Јd5) 34...ўd8 (I somehow find it harder to believe in 34...ўe7 35.gxf4 ўd6 36.Ґe4, which makes computer still more happy) 35.gxf4 Јd5+ 36.Ґe4 Јd6 White has enough compensation, but the win is still "far far away"...) 32...Ґd7 33.Јxb7 (33.¦xe6+ ўd8!) 33...¦b8 34.Јxa6 (more reasonable seems34.Јe4 and +/=looks like an appropriate estimation) 34...Јxa6 35.Ґxa6 Ґxf4 36.gxf4 ¦b4 and the endgame starts to look drawish; moreover, the silicon intelligence tries to suggest an idea that even after 31...ўd8 32.¦g2 (32.Јe3 Ґd7) 32...Јa3 33.¦d2 ўc7 Black is OK, and it is impossible to argue with him, as usual. 32.Јg6+ Topalov "habitually" complicates the play, although many in his place would have searched for clarity after 32.Јxe5! Ґxe5 33.Ґg6+ ўd8 (33...ўe7? 34.¦h7+ ўd6 35.¦d1+ ўc6 36.Ґe4+ ўb6 37.¦b1+ ўc5 38.¦h5+-) 34.¦h7 Ґd4™ 35.¦d1 e5 36.ўe4 Ґg4™ 37.¦d2 exf4 38.¦xd4+ ўc8 39.gxf4+/- In spite of the scarcity of the material left on the board it is difficult for Black to save himself. The f-pawn would, in all probability, cost him a bishop. 38.¦xb7+? A system failure due to nervous stress. 38.Јg7!! 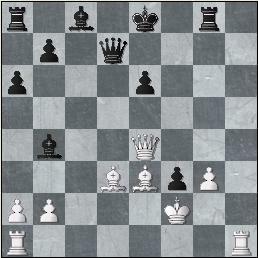 immediately decides the outcome, but also not bad is a "human" move 38.¦h7! ¦xf4 39.¦xb7+ ўc8 40.¦bxd7 (40.¦b1 would lead to greater material gains, but we try to play "in a human way") 40...Јe1+ (40...¦h4+ 41.¦xh4 Јxh4+ 42.ўg2 ўxd7 43.Ґxa8 Јc4 44.Јb1+-) 41.ўg2! Јxe4+ 42.Јxe4 ¦xe4 43.¦dg7+- All this is surely not so evident, but this game is not being played a in a blitz district championship with 30 euros in the kitty! 40...¦c7? During time trouble there is, alas, no time to look who is smiling to you be it even Fortune herself, as is the case with Morozevich. 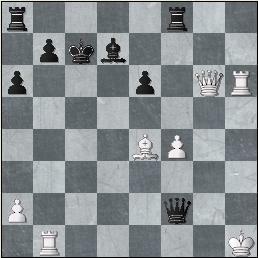 The last White's moves haven't been the best ones, and now after 40...Јf4! Black has every reason to hope for happy outcome of the game. Ґad is 41.fxe6? Ґe8 There will be no surprises in this game any more. 41.fxe6 Ґe8 42.Јg5. A "tougher" decision is, perhaps, 42.Јg4 with a nice checkmate idea after 42...¦f4 (42...Јf4 43.Јxf4 ¦xf4 44.¦h8 ¦e7 45.Ґg6, and the bishop is lost) 43.Јh3 ¦xe4 44.e7+, but it would have been incongruous to condemn the move made during the game. 44.e7! ¦c5 45.Јg3 White wants to give a check 46.Јh3 and simply grab the a6-pawn with his rook. Time has come to sum up the results of the first part. There are two leaders in the tournament. 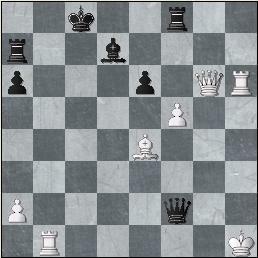 Magnus Carlsen, in my opinion, has not gained a single victory that can be recognized as consistent with the laws of chess – a rook ending with "differently colored" bishops in the first round was closer to a draw, and I strongly suspect that Morozevich had simply overlooked the Ґd3-move. The events in the games against Ivanchuk and Topalov cannot be explained in purely chess comments. But all this is purely logical. When you have all the country behind you, and you have already been a hundred times declared a chess genius, you can "break" your opponents with any kind of move. Believe me, the outcome of a game between two more or less comparable in chess strength players is decided at the board and not on it! Anand is not much better – games against Morozevich and especially against Leko could well turn into defeats. A strange lay of the land, isn't it? Ivanchuk makes a very good impression, but his chances to win the tournament are low, as he has been missing his opportunities in practically every second game – against Leko, against Svidler, against Anand! But a champion must collect "excessive" points, not fall short of his "legitimate" ones. I cannot predict what is to be expected of Aronian in future. I have no doubts that Topalov, who as usual cannot "enter into a tournament" in the first part, will "eat some vitamins" and become quite a different man in the second part. Three players failed to win a game, although each of them had been following his own way to this result. I will refrain from any comment as regards this and wish each of them an effective play in the second part of the tournament.